Ben Simmons appeared, and received a haircut, on 'The Shop'. 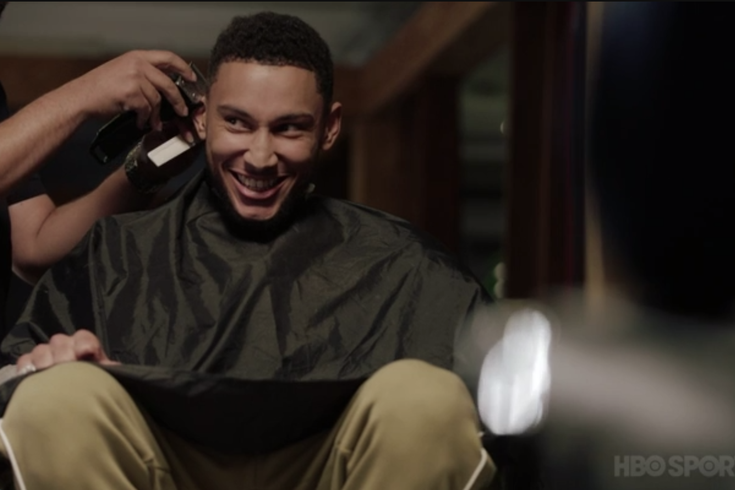 Sixers point forward Ben Simmons appeared on LeBron James’ HBO Sports show “The Shop” on Friday night, alongside fellow NBA players Victor Oladipo and Mo Bamba, James himself, WNBA star Elena Delle Donne, and business mogul Maverick Carter. The first five minutes of the episode were effectively about Bamba and Simmons, and the idea of balancing your focus on basketball with your focus on yourself as a young professional basketball player. Carter and the crew threw a few questions Simmons’ way as a sort of reference point for Bamba while the Orlando Magic rookie approaches his first year in the league. "From where I am now, to a year ago, I would’ve thought I knew so much more a year ago, and now looking back I really didn’t know anything. Nothing. I was thinking, ‘I know what’s going on, I know how to handle my business,’ and now, a whole year and a whole season where I played, way more." "One thing Bron told me is, I’m not going to be the player I want to be right now, this season. I might not be coming out hitting threes and stuff, but keep chipping away. I’m going to get to that point eventually, if I keep working towards it." "I’m just watching highlights and stuff like that, thinking I’m doing so well. I’m watching my plays thinking, why did I do this? What am I doing? I’m making mistakes with certain things that, at the time, I’m thinking it’s not a big thing. But now that I look at it, I’m like … there’s so much growth that I have, that I need to get better at, and it’s going to take time. It’s not going to happen overnight." "Definitely, because I know what I’m capable of. Even without the jumper and hitting threes, whatever the case is, I’m still the same player. But I don’t need to worry about what people are saying on the Internet. Like, who are they? Some trolls, whatever it is." As Simmons often does, he clearly played things close to the vest. It’s his current MO, and it’s hard to blame him considering he’s a 22-year-old mega-star just starting to flesh out his personal brand. The bit about developing his game was sort of interesting, if only because it shows he’s open to the idea of adding a three-point shot to his game one day. He was seen in Instagram videos this summer working on his jump shot, but Simmons cooled down expectations at media day when he explained he’s not going to come out firing from deep this season. Oh, and Delle Donne (a Delaware native) said she’s been able to focus on the process (trust it) because she started seeing a sports psychologist a few years ago. Just wanted to point out a Process reference, even if it’s inadvertent. If you have an HBO login, you can watch the full episode here. The NBA regular season starts on Oct. 16.